Alternative fuel is all very well, but it’s pretty damn hopeless, regardless of good intentions, when all you can get on the high street is regular four star by the litre. Realising the problem of not having a supply infrastructure in place, Tokyo Gas and Mitsubishi Heavy Industries have come up with a much smaller hydrogen pump that should make it simpler to fit out normal petrol stations. The new separation devices generate the hydrogen from normal city gas and water vapour using alloy membranes as filters instead of by the older method of purifying hydrogen. This lends itself to equipment that is small enough to go mainstream [subscription required]. Previous attempts managed to get the gear down to the size of a bus, whereas the new pumps are closer in size to a large car and, therefore, far more likely to be adopted. 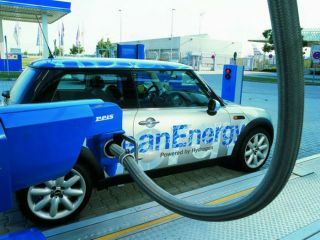 Naturally, the two companies hope that there technique will help fuel suppliers take the plunge, which will, in turn, make consumers more confident about switching to cleaner fuel-cell vehicles.